Anton Goryunov from around the world reports takes a look at North Korean leader Kim Jong-Un and the death recently of Jang Song-Thaek who is the North Korean leaders uncle. The North Korean news reports from a TV presenter in the area announced that Jang had been executed the same day. Jang helped Young Kim's pops Kim Jong-Il who 23 years ago struggled to feed the residents in North Korea and many died because of starvation for years after. Kim Kyong Thaek Hui, Jangs wife has not been seen for time, the fear is that she might be at risk of similar harsh punishments. Because of the strange news the US State Department and the British Foreign Office will be keeping watchful eye on the area. The Twitter blog shared an interesting tweet about executions and how a family thing does not change anything. The United States has warned North Korea against any "provocative acts". The execution of leader Kim Jong Un's uncle fall from grace of a most senior figures in North Korea. Deep instability in the country's regime. Jang Song Thaek came from being a municipal bureaucrat to a Government of North Korea vice chairman of the National Defence Commission and member of the Political Bureau of the Central Committee of the Workers' Party. The chief architect of China, Jang and his vision for economic policy with neighbours of North Korea. Jang married his aunty Kim's Jong Un from North Korea and he was very protective of her, she accompanied him everywhere whilst doing public speaking and helping other people on their journeys around the world. Above is a picture of the court holding room, some of the last pictures ever seen of him before his judgemental execution by firing squad. On passing judgement they called him a dog and all kinds of things. The brutal killings of these executions are done by a line of men with heavy machine-gun rifles and then the purging begins. Il's sister Kim was shocked to find out that a few days before the execution that he was whilst being arrested out partying and singing karaoke, they turned of the machine and interupted his song, arrested him and frog marched him out of the disco's premises. The vice-chairman of the National Defence Commission often went out partying so this was nothing unusual, he and his nephews were known to go out and have fun on days away from the Game of Thrones. Some of his associates were sot weeks before for their hedonistic behaviours whilst out and about on the town. The fear was because perhaps of his ties in China that he would overshadow what was going on in North Korea, someone somewhere down the line smelt a rat and the associates spoke about some sort of coupe which did not help. This news made Uncle Jong out to be some sort of liability and the news of a coup was the final icing on the cake. It pushed him overboard and in the room of thrones threatened North leader Kim Jong-un, he was probably angry about his friends being shot a few days before hand. A lot of this information has been fed by Northern Koreans mainstream news. How South Korean's in Seoul interpreted this is that the Northern dynasty were simply creating bigger news to avoid the fact that living standards up North are much worse than they are down South. Jang Song Thaek from North Korea was very secretive, he always knew that the family had never really gotten over the death of pops and that North Korea was a very tricky country to predict how you should act and what should you do but more importantly what you should not do. So even though it may have come as no surprise knowing that you are to be executed he must have also been very confused and curious to know why everyone in the realm wanted to kill him. 20+ years of famine and low living allowances was enough for the country to justify and take out its pent up anger on The Man From Uncle since the real trouble maker had died two years since. The rewards for people in the country were special stickers and badges for doing good work and proving that they had watched certain things. Lots of military staff checkin via mobile smart phones and awarded badges and stickies for doing good stuff. 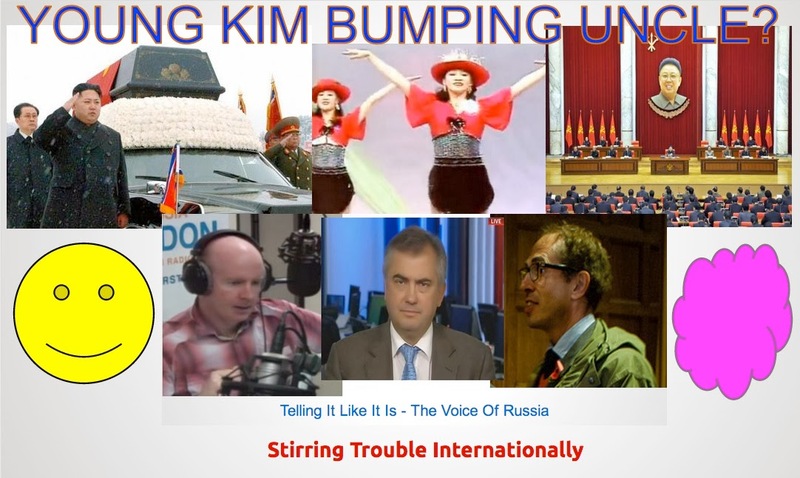 Ruediger Frank an academic illuminati member graduating from North Korea's Ivy League equivalent Johns Hopkins University Institute brought up the thing about Young Kims uncle purging the area and this revved up the prosecution. He drew his argument from local history dating back to 1948 three years after World War II and United Nations statistics show that they were much more well of then compared to the South although reports were that a large percentage of the population who were not in the top 2% bracket were although broke, quite happy. "Certainly, it's something we're concerned about, and we would urge the North Koreans not to take provocative acts, not to do so going forward, because it's not in the interest of regional stability,"
Friday Dec 2013 US State Department Marie Harf. US President Barack Obama via Jay Carney a media representative is said to have contested the execution saying something along the lines of it should never have happened. So a crack command team of US intelligence agencies have been assigned to find out more about the geography of the country and eventually try and turn this into special website code so people can understand better and contribute to North Koreas education so that it never happens again. America are currently sharing the news with China too, its a great conversational piece.